Medical device security researchers have figured out how to turn off a pacemaker via remote control. Kevin Fu, an associate professor at the University of Massachusetts at Amherst and director of the Medical Device Security Center, said that his team and researchers at the University of Washington spent two years working on the challenge. William H. Maisel, a doctor at Beth Israel Deaconess Hospital and Harvard Medical School, granted Fu access for the project. Fu received an old pacemaker as the doctor installed a new one in a patient. The team had to use complicated procedures to take apart the pacemaker and reverse engineer its processes. Halperin said that the devices have a built-in test mechanism which turns out to be a bug that can be exploited by hackers. There is no cryptographic key used to secure the wireless communication between the control device and the pacemaker. A computer acts as a control mechanism for programming the pacemaker so that it can be set to deal with a patient’s particular defribrillation needs. 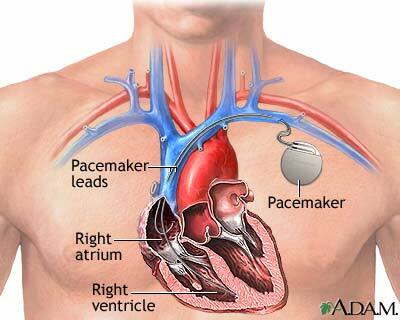 Pacemakers administer small shocks to the heart to restore a regular heartbeat. The devices have the ability to induce a fatal shock to a heart. I'm sure someone can think of a better sfnal reference for the idea of turning a person off by remote control; I do recall the "heartplugs" installed by the evil Baron Harkonnen in the (awful) movie version of Dune. From Defcon: Excuse me while I turn off your pacemaker; see also the author's paper Pacemakers and Implantable Cardiac Deﬁbrillators: Software Radio Attacks and Zero-Power Defenses [pdf].